In Amrut Tabiyar’s story, we discover the vastness and influence of Art in lives of people. It is an inspiring story of letting joy of creation unseat the harsh realities of life. Amrut Tabiyar is a Security Guard at GNLU and his free time consists a very interesting hobby of painting. He was so heartily engrossed in this activity that even the students of GNLU started helping his passion with materials. 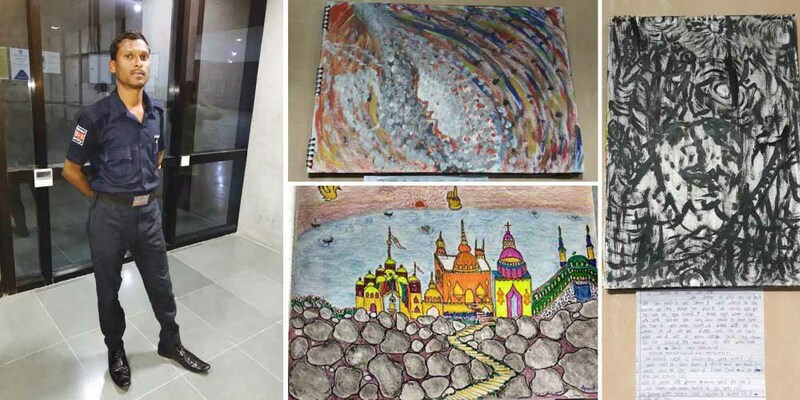 Pooja Sonware, a student at Gujarat National Law University, Gandhinagar, was pleasantly astonished one day to see security guard Amrut Tabiyar painting to his heart’s content. “I have been studying at GNLU since a year now and every day I notice him creating enchanting portraits using poster colours,” she said.“Observing his passion for crafting beautiful paintings every day, and his vision for thinking of fascinating ideas despite his background, I felt moved to take this step to recognise the artist,” Pooja explained what prompted her to contact Creative Yatra to cover Amrut’s story. Amrut, who hails from a humble family background, came to Ahmedabad from Dholvani, a village in Sabarakantha District, north of Ahmedabad, in search of a living. Scantily educated, Amrut joined as a security guard at the institute and discovered plenty of free time during his job. To yield optimum productivity out of this free time, he decided to paint picturesque portraits. “I am not academically learned, neither have I been professionally trained in this art. It is my passion to create something colourful that drives me to continue this activity,” says Amrut, sharing his story. “I face a tough time over managing the finances for my creative material, but the generous students of GNLU and the proverb ‘where there is a will there is a way’– always help me to get past this obstacle.” Amrut has made scores of paintings till date, and he continues to invest his time in Art above any other leisure activity. Amrut, whose art is inspired from his daily activities and his own dreams, explains his paintings with a note beautifully written in Guajarati. Surprisingly sometimes the note contains few poetic expressions too. To be able to do what you love – is a rare ability – and it is inspiring to discover such abilities in the most unexpected places. CY lauds Amrut’s courage to strive for his drive – like a true Yatri, he continues to enjoy his journey and not let his resources strapped reality deter his joy for creation. Amrut is a living example in our city that exemplifies that art is as much within as it is without. He showcases that art is hidden in surprising and unexplored places, moreso in the hearts of people. 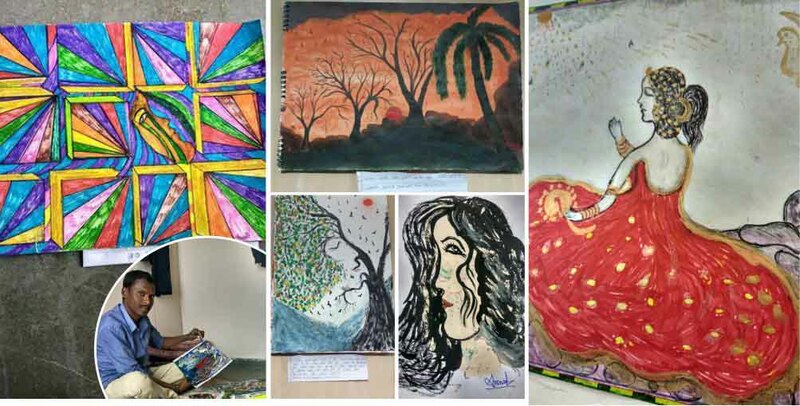 Team CY urges patrons to encourage Amrut and similar artists, across faculties of creativity, and make Arts an important aspect of societal lives.